Dream into Reality: If I was in a three wheeler I would have been dead meat! If I was in a three wheeler I would have been dead meat! Whilst facebook http://www.facebook.com/lankaenews said that the MP was in the vehicle that was involved and was quickly spirited out of the vehicle. He is a wealthy man, and a first time Polonnaruwa District MP for the UPFA, and it would be a shame if he is trying to get out of being implicated, and worse not taking any responsibility for the incident. It is for the reader to determine which is the more believable, and I hasten to add that the Island has turned into a Govt. mouthpiece with occasional balance, rather than a balanced paper with the occasional Govt. slant. The reason I point this out is that I was also the victim of a similar incident not too far away from the place of this particular one on the same road a few kilometers apart. 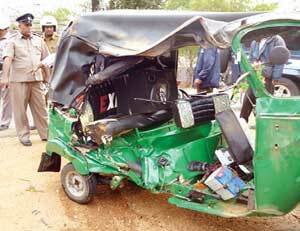 I would have been minced meat if I was in a three wheeler and am thankful at least I was in a Tata Cab. To date there is no assistance from the culprit Cabinet Minister to come up with anything considering the huge cost that accident has claimed on me, which only I know and it is now over 20 months on, still hobbling! The lack of justice in these circumstances where the driver of the Land Rover Defender will have to face legal proceedings, and a small fine placed on him with the MP footing it would be all the victims family can hope for. The real culprit is the system that permits the speeding vehicles to act as if they own the roads, and the system must compensate the family of the victim for at least the value of the human life lost. If this is not done, there will be NO care taken in the convoys speeding across the country and people continue to die on the roads uncompensated and just become another statistic in their lengthy list of horrors on the road. Until there are just laws to deal with such gross acts of savagery on the roads without impunity by the VIPS of the administration we will never be classified as anything but a Banana Republic with a Happy Banana to rule over us and not serve us! Rajarata Rale, you keep thinking thatt you have some very educated populas in your country and everthing can be Hunky Dory just like in a civililzed country where majority of the people are highly educated and very hard working. So, you need to concentrate on understanding your Vedda society and just keep suggesting how to fix it. We all know about your people , we know them very very very well. If you really want to do any good Rale, you need to use your super intelligence and some how get your nation to be useful one to the world. Now how would you do that ? Get into the power , run the country! You will know exactly what to do with your years of experience in 2 of the most civilized nations in the world. Don't think that those 2 countries just dropped entlightened over night out of sky! They worked very hard to achieve it. So, become a leader like George Washington, Ben Franlin, Abrahm LIncoln of 2012 and lead the coutnry out of its sorry status Rale. That is something you can do and you should do. All these other garbage you are concentraing on is useless really becuase we all know what you are repeating like a Parot. Very ԁesсriрtive post, I еnjoyed that a lot.